"I hate to think of my sister and my - well you, Trixie, getting into such tight places all the time." Trixie didn't have a word to say. She asked herself, "Was he going to say that I'm his best girlfriend? Darn it, now I'll never know." "You know what it means, don't you?" Jim asked. "It means that you're my special girl, Trixie," Jim said. "As if you didn't know that already." "I do," Trixie murmured. "Oh, Jim!" Trixie looked happily at her bracelet, then reached over and put her small, sturdy hand into Jim's. He closed his long fingers tightly over it. 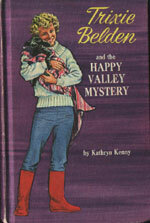 The ghost writer of this book is thought to be Stack as she was born in Idaho. The Bob-Whites, minus Dan, spend their Spring break at Andrew Belden's farm, while he is away in Scotland. Trixie is keen to solve the mystery of the missing sheep, but the Bob-Whites find themselves with their hands full learning about farm life and getting to know the locals. 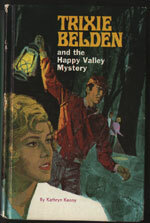 Trixie becomes jealous of a glamorous blonde who seems to enamour Jim, while she attracts the attention of the star athlete, Ned Schultz. 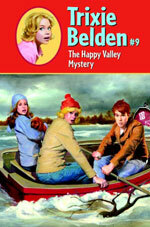 But these things are cast aside, when Trixie, Jim and Honey find themselves trapped in a flood and facing the most dangerous situation of their lives. 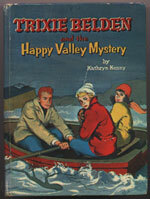 This book really tries to show Trixie and the Bob-Whites as ordinary teenagers who make mistakes. The Bob-Whites make a big mistake and risk the whole flock of sheep, but they work hard to right their mistake. They are fiercely protective of Westchester County and defend it to the hilt. Trixie and Honey aren't perfect skaters and get shown up easily by a glamorous blonde rival. Trixie, Jim and Honey make an error of judgement and endanger their lives in the most perilous situation they have ever faced. Trixie is jealous of the attention Jim is paying Dot Murray, but she receives just as much attention from Ned. Could Jim have been jealous of Ned? Stack continues to feminise Trixie and makes her aware of her tomboy behaviour and she tries to rectify it. The relationship between Jim and Trixie grows closer and he becomes more open about his feelings for her. 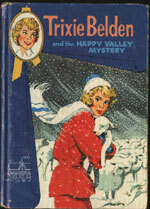 Trixie wonders about his feelings for her and in the first two editions of this book, she expresses her thoughts. However, these lines (in blue) were removed for the deluxe and subsequent editions of the book. This climaxes at the conclusion of the book when he gives her an ID bracelet with his name on it. 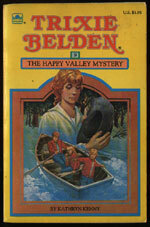 This passage remained intact until a later print run of the oval paperbacks, in which a line (in blue) was omitted. 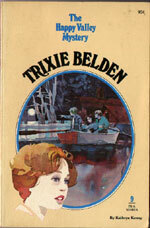 Why it was present in the first paperback printing, then later removed remains a mystery that only Trixie could solve. Jim reminds Brian that he's supposed to be the conservative one (p. 69). Diana can play the piano. Did she learn this after her father made his millions? The Beldens apparently had a cow, because Brian and Trixie helped deliver a calf. Also, they helped deliver a foal from one of the Wheeler's mares (p. 126). Mart claims he's a Scout and implies that Jim and Brian are too (p. 139). Di states that they have ten pen pals from India, Africa and South America and Trixie reveals that they fundraise by selling UNICEF stationery (p. 149). 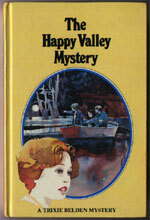 The puppy Trixie, Honey and Jim find in the flood is named Moses.